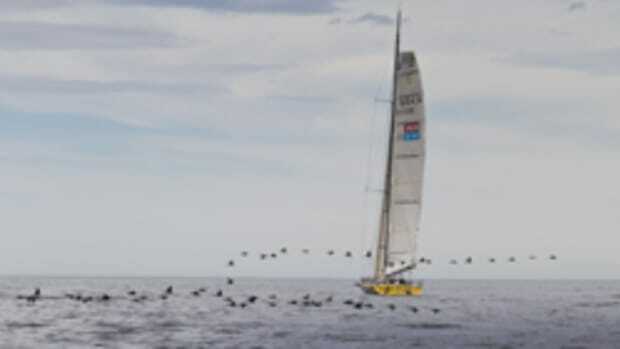 The end might be in sight, but the final sprint of the Velux 5 Oceans is far from over yet for overall leader South Carolina sailor Brad Van Liew, who has spent the last 24 hours battling a fierce North Atlantic storm. Choosing to seek out stronger winds to up his speeds towards La Rochelle, France, Van Liew sailed his Eco 60 Le Pingouin close to the eye of a depression. He was rewarded with boat speeds hitting more than 25 knots — but also paid the price for the move encountering howling 47-knot winds and crashing seas. Click here for the race website, where the competing boats can be tracked.